Visible Investing - See the outcome of your investment decisions before you make them. If you don't trust anyone with your money, read this! By law, only Registered Investment Advisors (RIA's) have a fiduciary responsibility to their clients. RIA's have to recommend the investments that 'best fit' client needs, and all fees must be disclosed. We require no personal information, you can provide only as much information as you feel comfortable disclosing. Visible Investment Advisors do not handle or have any control over your 401(k) funds. We provide you our professional advice and you carry it out. At the same time that responsibility for the timing and quality of retirement lifestyles are transferring to employees, investing has become more difficult. The law of compounding dictates that the largest financial gains are made in the final 7-10 years of employment (contribution years), so asset allocation and fund selection decisions are critical. During the final 7-10 years employees are most at risk from losses, as the window of opportunity to recover is very short. At retirement, there is a need to transition from the accumulation to distribution phase, ensuring that there is sufficient income to last a lifetime. Visible Investment Advisors has recognized this knowledge and experience gap, and offers 401(k) investors the professional advice they need at a price they can afford to pay. It will be unfortunate if even one employee has to work an extra day, or retire with less then they need to fund the retirement lifestyle they've earned. 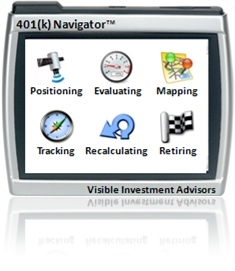 The 401(k) Navigator is not a gadget or a software program — it is based on Visible Investing principles, and administered by your own personal Registered Investment Advisor. We came up with the metaphor of a GPS because the 401(k) Navigator Program has many of the features of a GPS — providing specific detailed directions between your current position and desired destination. In case of adversity (market declines or life changing events), or if you take a wrong turn, it will recalculate a new route to your retirement destination. How are we as people you'll want to work with? 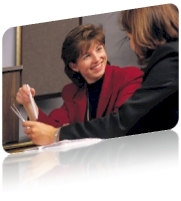 Visible Investment Advisors listen; are independent; provide specific advice; and have low, flat, fully disclosed fees. We pride ourselves on being people with whom you will be comfortable working.